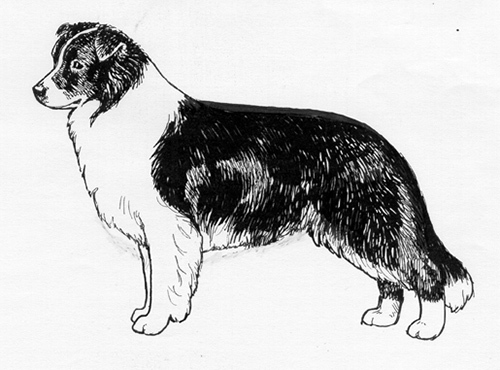 The Border Collie's rootstock is of western European origin, with northern England and Scotland being the specific areas of development. People wanting specific herding characteristics isolated individual dogs exhibiting those traits and bred them, thereby developing a "pure breed.” The Border Collie breed was established just over 100 years ago. They are specifically known for their "eye,” or almost hypnotic stare, when herding stock. Other specific traits include intelligence, speed, strength and an innate herding instinct. The Border Collie sets the standard in herding, particularly on sheep. This breed was historically bred for working ability rather than type. The Border Collie was recognized by the United Kennel Club on January 1, 1961. The Border Collie has good body balance, which enables him to change directions and speed quickly, from a high speed to a creep, a stalk to a steady lift. The smooth outline should show quality, gracefulness and perfect balance. There should be sufficient substance to convey endurance. Balance, outline, intelligence, temperament, and movement are of overriding importance. The Border Collie is thoroughly sound, willing and able to do its work. Working dogs are not to be penalized under any conditions for scars or blemishes that are due to occupational injuries. Faults: Any tendency to coarseness or weediness in the general appearance of the dog. The Border Collie is a fast, alert and intelligent dog that is anxious and able to work livestock under the direction of its master. They should be neither nervous nor aggressive, but keen and responsive. Essentially an old-fashioned Collie type. Fairly broad, no prominence of occiput. Stop well-defined. No fullness in cheeks. Tapering to the nose, moderately short and strong. Approximately the same length as the skull. The Border Collie has a full complement of strong teeth that meet in a scissors bite. Set wide apart, moderate in size, and oval in shape. Brown in color, except in merles where one, or both, or a part of one, may be blue. Expression should be mild, keen and intelligent. Ears are medium size, broad at the base and taper towards the tip. May be carried drop, semi-erect or prick, and need not be matching. Are sensitive in their use. Black, except in brown dogs where it may be brown; and in blue dogs, where it should be slate. Well developed nostrils. Strong and muscular; of good length. Slightly arched at the crest and broadening as it merges with the shoulders. Shoulders are well laid back, and the elbows are held close to the body. Straight and parallel when viewed from the front, from the side the pasterns are slightly sloping. Bone is strong, but not coarse. Slightly longer than tall. Athletic in appearance, with well-sprung ribs and a deep, rather broad chest. The loin is deep and muscular, not tucked up. The croup slopes gently to the set on of the tail. Thighs are long and deep, stifles and hocks are well turned. Rear pasterns are well boned and parallel when viewed from the rear. Oval in shape, with deep pads and tight, well arched toes. Nails are short and strong. Moderately long, reaching at least to the hock joint. Set on low, well furnished with hair, and with an upward sweep at the end which completes the graceful appearance of the dog. The tail may be raised in excitement, but never carried over the back. Varied lengths: long, medium or smooth. May be straight or wavy. The long-coated dog will have well-feathered forelegs, breeches and tail, and an abundant mane. The top coat is dense and of medium texture. The undercoat is soft, short and dense to provide adequate weather resistance. Black and red. Less predominant colors include gray, blue merle, red merle, lemon and sable. May have white trim only, and/or may be accompanied by tan points. All colors or combination of colors and/or markings permissible. Solid color, bi-color, tri-color, merle and sable dogs are to be judged equally with no one color or pattern preferred over another. White markings may be clear white or ticked to any degree. Random white patches on the body and head are permissible but should not predominate. Color and markings always secondary to physical evaluation and gait. Ideal height at the withers for males is 21 inches, slightly less for females. Free, smooth and tireless, keeping the feet close to the ground. Gait conveys the impression of being able to move with great stealth and speed.